Caption: A cross section from the retina of a non-human primate shows evidence of the production of a glowing green protein, made from genes the virus delivered —proof that the genetic cargo entered all layers of the outer retina. Cell nuclei are labeled in blue and the laminin protein is labeled in red. Scientists based at Berkeley have engineered a virus that can carry healthy genes through the jelly-like substance in the eye to reach the cells that make up the retina—the back of the eye that detects light. Current gene therapy techniques deliver therapeutic viruses using a needle that must pierce the retina to deliver its cargo. It’s a risky procedure because it can cause retinal detachment, potentially making the condition worse. The NIH-funded researchers sifted through hundreds of millions of newly engineered viruses to identify one they called a 7M8, which had the right properties to penetrate the cells of the retina. Their ultimate goal is to cure two types of hereditary blindness—X-linked retinoschisis (which only affects boys) and Leber’s congenital amaurosis. When the researchers tested 7M8 in a healthy primate, the virus delivered genes to the retina and to the fovea—a hard-to-penetrate region of the retina responsible for fine-scale vision. 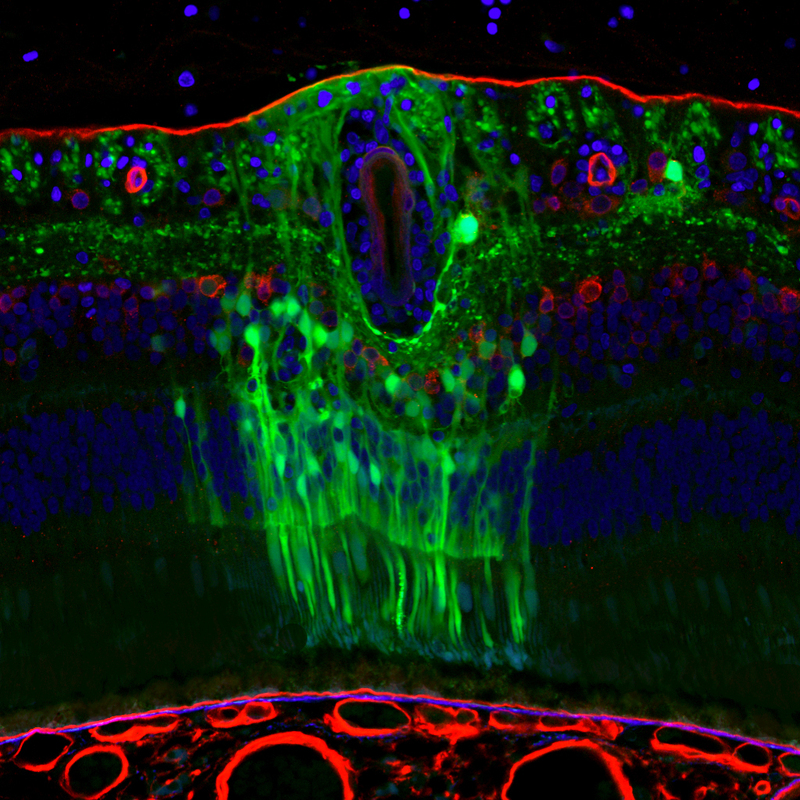 You can see this in the picture: the green is glowing proof that the virus successfully delivered its genetic cargo into the photoreceptor cells of the retina. It’s early days, but this is a significant step in the development of new therapies that will restore sight to people with both inherited and age-related forms of blindness. I am regular visitor. How are you everybody? This article is truly fascinating.